​This past June is when Canada hosted the North American Powerlifting Championships, and soon the Canadian Powerlifting team will have the privilege to step onto the international stage again, in their home country, at the Commonwealth Championships. This years’ Commonwealth Championships will be hosted in Richmond, British Columbia at the Olympic oval. Team Canada will be defending multiple titles, and world records as they send the best of the best to take on the rest of the Commonwealth countries. ​​One of the athletes that will be competing at the Commonwealth Championships is a sub-junior who hails from Calgary named Deston Yee. ​Deston is currently ranked first in the bench only competition and third in the three lift competition in the 83 kg sub junior class, which isn’t bad considering this is his first international competition. In Deston’s first and only year of powerlifting he has competed in four three lift competitions, and in one bench only competition and is looking forward to giving it his all at the Commonwealth Championships. ​ Right now, Deston holds the Canadian National record in bench press so it is no surprise that he prefers bench press over squat and deadlift. Outside of lifting Deston plays basketball and badminton and is in grade 12 at Central Memorial High School. He plans on attending university after he graduates. 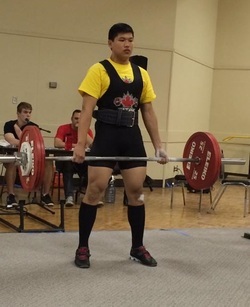 ​Another young athlete to keep an eye on is Jason Luo who trains out of Edmonton. Jason attends the University of Alberta in the faculty of science and dedicates all of his spare time to Powerlifting. Jason started lifting two years ago, with his first meet being Power Surge in 2013. Originally, Jason’s heart was set on weightlifting, but after a friend urged him to compete in Powerlifting he was immediately hooked to the sport. ​Jason has a fair bit of experience as he has competed at the National level and at the 2015 International Powerlifting World Championships. To top it all off, he also holds all the National records for 59 kg Junior class, as well as the National Open squat record. ​Accompanying these two athletes and the rest of Team Canada is the appointed Head Coach and the Alberta Powerlifting Union President, Avi Silverberg. Avi’s athletic career started in swimming, where he competed on the national team. After Avi retired from swimming he was steered into powerlifting by some local lifters from the University of Calgary. This lead him to compete on the World stage three times and claiming the National bench press record in the 120 kg open class. ​As a coach, Avi’s favorite competitions to go to are the Canadian National Championships because it is about more than just lifting -- it's also about the community. ​Avi started coaching through working at the Calgary Olympic Oval as a practicum student and strength coach for the hockey, speed skating, and football teams. He then decided to complete a Master’s degree in Kinesiology with a focus on Master-aged powerlifters at the University of Victoria. Since then, Avi has coached at four World Championships and runs his own coaching company called Pursuit of Strength. ​His favorite aspect of coaching is the complexity that comes along with managing different lifters and ever-changing competition variables. ​Being immersed into the coaching world has lead Avi to some very proud moments, such as coaching Team Canada at the 2015 World Championships in Finland, watching Kelly Branton claim third overall out of all classic men at the World Championships, and most of all watching his own mother break National records at 63 years of age. Going into the Commonwealth Championships Avi is hoping to develop a positive team atmosphere in order to aid every competitor to reach their highest potential, and of course, secure the highest rankings possible. Overall, Team Canada has a promising chance of claiming multiple world records and awards so it will be an exciting week in the city of Richmond! Please click HERE to check out our upcoming events. As a high school student, Bryce Krawcyzk was always a skinny kid and the only lifting he participated in was doing bicep curls with his friends. Around 2008 was when Bryce decided to switch his lifting goal from having giant biceps to the goal of gaining mass and strength, which lead him to start training the lifts of squat, bench press, over head press, and deadlift. Even though his technique was poor and he hated deadlift with a burning passion he still pressed through and kept training hard. However, competing was never a priority as Bryce was busy searching for a career that he could be passionate about. While he was constantly changing career paths, he was consistently training and becoming completely consumed by all things lifting. Through the countless hours of research it finally dawned on him that he should pursue a career in fitness. Surprisingly, Bryce’s first class he ever instructed was an all women fitness group and despite feeling awkward the class went great and he knew that this was the industry for him. What then led Bryce to powerlifting was when his boss at the time, Neil Tkatchuk, took him to compete in his first competition in 2012. During his first competition, Bryce was inspired by the work ethic and physical strength that the other lifters had and eventually Bryce decided to move to Calgary to do a 2 year program at Mount Royal. Bryce then worked with Peak Power to put all his extra energy into becoming a powerlifting athlete. Bryce remembers “nearly dying multiple times” because of the demanding programs he was put through, but the hard work paid off when he won his first provincials and went on to take silver at the 2014 Canadian Nationals. But this was nothing compared to the success that Bryce would experience at the 2015 North American Powerlifting Championships where he delivered a groundbreaking performance. That July was Bryce’s first international competition where his main goal was to take the Open 105 kg World Record for Deadlift. But not only did Bryce break this record pulling a 343 kg (755 lbs) deadlift. He also went on to win the Best Overall Classic Male award with a wilks score of 490 along with taking around 15 other national and international records. The surreal feeling of accomplishing this milestone was well deserved for Bryce as he has spent many years working hard to be one of the biggest lifters in the world. As if this wasn’t impressive enough, Bryce is also the proud owner and founder of the Calgary Barbell Club which has around 40 members that participate in multiple strength based sports. The tight knit community at Calgary Barbell is what Bryce attributes to his international success, he believes that his own personal development wouldn’t have been so great if it weren’t for those who are around him. In fact, Bryce’s favourite part of powerlifting is the people he has met and the business opportunities he has been able to seize along with it. Through powerlifting Bryce has found focus, passion, and the opportunity to teach new lifters that it takes patience, consistency and surrounding yourself with the right people to be successful. At this moment Bryce is preparing for the 2016 National Championships with the hopes of winning the spot to represent Canada on the World Stage in Killeen, Texas. Christine Castro hails from a small farming town that is known for being the home of the largest beaver statue in the world, Beaverlodge. However, coming from a small town did not stop Christine’s athletic pursuits as she went on to play varsity level basketball. Through basketball is where she was first exposed to lifting weights, but she would have never guessed that one day she would step on the platform for her first powerlifting competition in August, at the 2015 Evolve Open in Edmonton, Alberta. Not only did she surprise herself during her first competition, but also the entire province of Alberta when she took the provincial deadlift record as a 63 kg Junior pulling a whopping 175 kg (385 lbs). Along with lifting these records, she also took home the prize of best female lifter with a wilks score of 405. One year prior to this competition is when Christine tested her maximum squat and hit 102 kg, which is a far cry from her 137.5 kg squat that she smashed during the Evolve Open (that is a 78 lb difference). Testing her squat, along with the encouragement from her boyfriend is what motivated Christine to eventually sign up with the Strength Athletes and focus completely on powerlifting. Overall, she had only trained 10 weeks before competing in her first powerlifting competition and needless to say she has a bright future in the sport. Christine aspires to one day make the national team and compete on the world stage. Now, not only is Beaverlodge home of one of the biggest animal statues in Alberta, it is also home to one of the biggest deadlifters in the province. A little more than one year ago is when Alfred Jong decided he wanted to enter the world of competitive powerlifting. However, with having very little experience with the sport, Alfred turned to a fellow lifter in order to learn the rules and regulations of the International Powerlifting Federation (IPF) and decided that powerlifting was indeed the sport for him. Along with other local meets, Alfred has competed at the 2014 Western Canadian Championships, and the 2015 Canadian National Championships. Now, to reach the national level and claim provincial records the first year of powerlifting is a feat for any athlete. However, not only has Alfred succeeded in performing on the national stage and tagging some records to his name, he has also established his own club along with fellow lifter, Rhonda Wong. Alfred and Rhonda are the founders of the Lab Rat Powerlifting (LRP) club based out of Evolve Fitness in Edmonton, Alberta. Both of these athletes have only been powerlifting for one year and this past August they decided to host their first competition, the 2015 Evolve Open. The LRP club is the home club for approximately 20 members and their numbers are increasing fast. Their increased popularity is attributed to their central mission of making sure that all their athletes have the best possible experience at every meet. Alfred and Rhonda have worked hard to ensure that their club is open to all levels of lifters by providing an environment where experienced lifters can mentor novice lifters. The LRP strives to show that not only is Alberta Powerlifting the strongest sport in the province, but also the most supportive. The purpose of this page is to celebrate and recognize members within the Alberta Powerlifting Community.